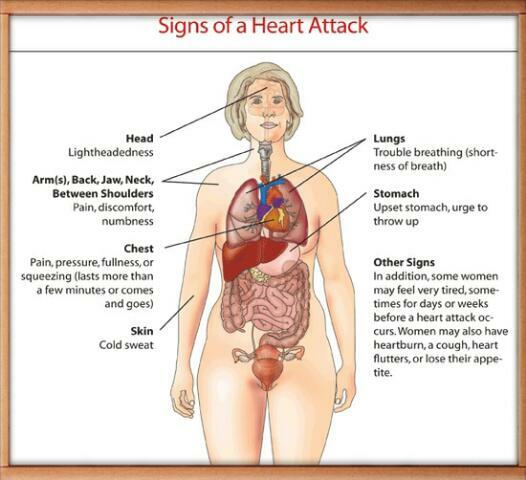 The heart attack can be sudden & almost without warning, which makes it one of the deadliest medical conditions. However few know that it is POSSIBLE for us to detect subtle clues to an impending cardiac event even a month before the actual heart attack. When a CORONARY ARTERY has a gradual build-up of plaque, HEART ATTACK occurs. This results with blood supply loss & eventually the attack. During heart attack tissue dies as a result off the lack of blood flow & person experiences an excruciating pain & crushing pressure. If there is no prevention , the death of the tissues can be fatal. Now I am going to tell you the symptoms that can point to a possible heart attack that could happen in the near future. CHEST PAIN OR DISCOMFORT: For both women and men, the most common sign of a heart attack is pain or discomfort in the center of the chest . The pain or discomfort can be mild or strong. It can last more than a few minutes, or it can go away and come back. See the figure, "Signs of a Heart Attack," for a full list of heart attack signs. EXCESSIVE FATIGUE: When a coronary artery narrowing is reaching a dangerous level your heart receives less blood, which makes the heart muscle work harder than normal & thus excessive tiredness. SHORTNESS OF BREATH: When the heart gets less blood means less oxygen is carried to the lungs which results in shortness of breath.The cardiovascular & respiratory system is completely depend on each other. so this can be a good indicator of an attack. WEAKNESS: When your body lacks oxygen because of reduced blood flow, you will feel weaker than usual because of the artery narrowing hinders the blood circulation, thus your muscles don't receive enough blood. DIZZINESS AND/OR COLD SWEATS: When a heart attack is on its way, you may experience unusual episodes of cold sweats and/or dizziness. The poor cardiac circulation restricts the blood flow to the brain, which results with clamminess & dizziness, especially when you get up suddenly of your chair or bed. DISCOMFORT IN THE CHEST: The lack of oxygen to the heart muscles as a result of the lesser blood flow can cause discomfort in the chest. The pain may increase until the actual heart attack happens. If you think you, or someone else, may be having a heart attack, wait no more than a few minutes — five at most — before calling 911. Do not drive yourself or let a friend drive you. You may need medical help on the way to the hospital. Paramedics are trained to treat you on the way to the emergency room. Getting there quickly is very important. Treatments for opening clogged arteries work best within the first hour after a heart attack starts. Women are more likely than men to die of a heart attack. One reason is that women often have the less-common signs. This can lead to misdiagnosis. If you think you're having a heart attack, get emergency help right away. Don't let anyone tell you that you are overreacting or to wait and see. Ask for tests that can show if you're having a heart attack. It's better to be safe than sorry.